It would be fair to say that many a good strategic plan failed to be implemented successfully due to the lack of resources - typically a lack of money, people or both. In operational planning it is therefore very important to be realistic and to understand that resources are limited. Managers need to carefully plan the use of funds, the acquisition of facilities and equipment and the development of people within the organisation to achieve goals. The core business of recreation organisations is the organisation of events, programs and activities for the enjoyment of its members or customers. In profit-oriented organisations such events, programs and activities are generally fully funded by the participant. The total fees paid by participants covers all the delivery costs of the event i.e. administration, promotion, materials, instructors, building maintenance and even taxation. If the fees set by the recreation organisation do not cover all costs, the business will make a loss. 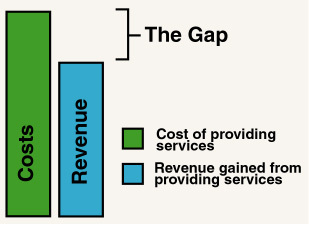 It is common to find, however, that non-profit organisations experience a shortfall between the total costs of providing activities and services and the total fees raised by participants as shown by the figure on the right. This funding gap arises due to the very nature of the non-profit organisation, which exists to provide quality experiences for persons with an ordinary or average capacity to pay. For example, families may have very limited capacity to pay for children selected into teams to travel interstate for tournaments, representative matches or to take part in special coaching clinics. In order to assist parents, the non-profit organisation tend to fill the funding gap by seeking government funding, commercial sponsorship and/or other fundraising such as raffles. Therefore in formulating the operational plan, it is important to consider how each strategy will be funded. It may be possible to fully fund some strategies by participants fees but other strategies require funding to be pursued from variety of sources. Generally, most strategies have some self-funding capacity, that is some revenues can be derived directly as a result of the strategy. The table below explains this concept more clearly. Conduct social events appealing to the members aged 18-25 Events may be funded by participant fees and/or special on-the-night fundraising schemes. If a strategy has no self-funding capacity it may be prudent to question whether that strategy is feasible. However a special point to note is that there is often a time lag between the incurring of costs and the gaining of revenues, and this time-lag may be funded by a loan. An example of this is the construction and/or improvement of facilities. The up-front building costs are recouped over many years through charges levied on users. A limiting factor to what sporting organisations can achieve is linked to their ability to attract sponsorship and media profile. Moreover these two factors are closely related. For most sports organisations, achieving any significant level of sponsorship is an almost impossible task. Potential sponsors are mostly interested in television exposure of their company name. Unless a sports organisation has high profile athletes they are unlikely to achieve such television exposure. Sponsorship therefore is a source of funding that, except for a few $100's, is immensely difficult to achieve. Organisers of sport would do better to concentrate their efforts on other sources such as merchandising. An organisation's structure must be taken into account when developing an Operational Plan. Planners must allocate each and every strategy and task in the Operational Plan to an individual, or else the likelihood of success will be diminished. Different organisation structures suit different types of organisations. 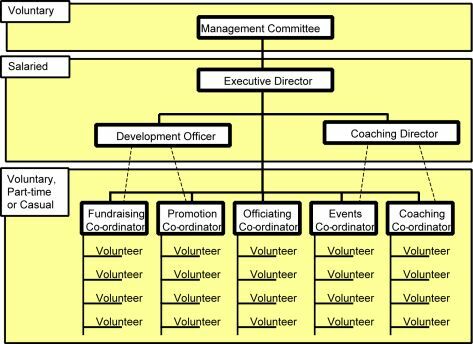 The organisation structure of a non-profit organisation can be very different from a recreation enterprise that is profit-oriented. In many cases the implementation of strategies and tasks within the Operational Plan is dependent on the availability of physical resources. If not owned, they can however be hired or borrowed. Determining physical resources necessary to implement strategies is an aspect of operation planning. Planners must determine the amount funding required to purchase, hire or maintain physical resources. Furthermore the acquisition of a particular physical resource may become a strategy in itself. The Operational Plan is about coordinating resources (people, money and physical resources). Time is also a resource that is not unlimited. For example, events must happen on a certain day, programs have a defined period, and services may be available only at specific times. The co-ordination of people to be in the right place at the right time is clearly a major aspect of Operational Planning. The dates of the organisation's own events are dependent on the dates of other allied organisations i.e. the date of the state championship is dependent on the date of the national championship. The process of formulating "The Calendar of Events" is an essential part of the Operational Planning process and it is one that requires a clear head, plenty of information and a band of dedicated workers with several hours to spare.